See a great video demo of the ESSENTIAL Wall Dimmer at GIZMODO.com! ESSENTIAL Square Wall Dimmers are a completely new and aesthetic way to adjust the lights in your home. Instead of reaching for a traditional cold, plastic dimmer switch, imagine adjusting your lights with just a touch of soft, inviting fabric. A simple tap of the tufted textile sensor turns on, off or dims the lights. Our fabric dimmers transform a purely mechanical task into an intriguing sensual experience and add a beautiful touch of contemporary design to an otherwise plain wall. 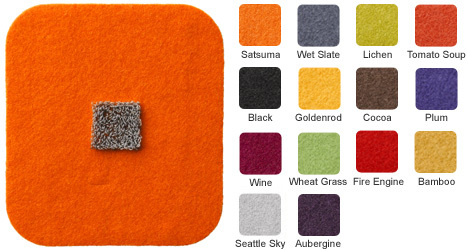 Each dimmer is handcrafted in Seattle, WA from Designtex wool felt, conductive yarns, neoprene, and acrylic. Electronic fibers are embedded directly into the material, so there are no hidden buttons or switches in the fabric. All you feel is the allure of a soft, fuzzy surface. Available in 14 captivating colors, ESSENTIAL Square Wall Dimmers are modern, minimalist, and luxurious. Our dimmers put the finishing touch on any interior. Also available in double gang and triple gang configurations. Easy-to-install, the ESSENTIAL Square Wall Dimmer is antimicrobial, stain resistant and UL listed. All IFM's high quality, exclusive electronic textile products are rigorously tested for safety and durability. ESSENTIAL Square Wall Dimmers are available for wholesale orders only. Please contact IFM for details. And because there are multiple styles and colors to choose from, every boring light switch in your home can become an homage to your favorite accessory. We LOVE our dimmer and totally plan on getting a bunch more when we move to our next place! Thanks again for a great product and great service!